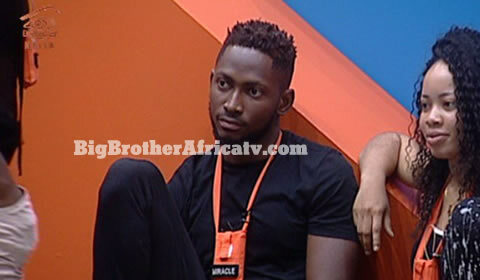 For the second time, Miracle grabbed the Head of House title during this season of Big Brother Naija 2018. It seem as if Biggie’s challenges increase in quirkiness as the weeks go by. Today Biggie asked Housemates to fit stockings on their heads and walk in line to knock the water bottles on their path. However the trick was that Biggie’s Ninjas had added a tennis ball in the stocking that Housemates had to enter in a white cup at the end of their bottle line. Upon learning about this twist, Tobi, Lolu and their peers all burst into laughter and Nina was still giggling by the time they all took their position behind the lines, all ready to compete. On the sound of the buzzer, with hands in the back, Housemates stumbled around as they strove to advance as fast and focused as possible. Yet chuckling could still be heard as the Challenge appeared more puzzling than anticipated. Although all had started at the same time, it is Miracle whose cup was filled first. He lit up to be acknowledged again and when Biggie asked him to choose a Housemate to share the luxury bedroom didn’t hesitate to name Nina. However he will only find out whether he as immunity or not after tonight’s Live Nominations show.